Learn how to make these supremely rich & fudgy brownies from scratch! They’re really easy to make—no mixer required! Only 71 calories with no refined flour or sugar, too! While recently in New England, we stopped for a late lunch at a cute café in Vermont in the early afternoon. As we walked inside and towards the back of the restaurant to the large table set up for our group of twelve people, I felt like I was walking through a cozy log cabin… Wooden floors, walls, tables, and chairs filled the entire space! The kitchen sent out a gigantic amount of food for our lunch, starting with bowls of mixed greens and pasta salads, followed by platters of sandwiches with chicken, turkey, and caprese fillings, and even a pitcher of hot apple cider and bags of crunchy potato chips. They definitely took good care of us! After our meal as we wandered back towards the front of the store, nearly every single person in our group stopped to look at the glass display case of sweet treats right next to the register. Although fairly full from lunch, we almost unanimously decided that we still had room for dessert… Those cookies, cupcakes, bars, and even oh-so-fancy chocolate mousse cups looked really tempting! Yet as a chocoholic, I opted for the huge, oversized brownies sitting in the lower corner of the display case. Supremely rich, supremely fudgy, supremely chocolaty… And with a supremely decadent chocolate frosting on top. Simple, classic, and worth every single bite! Many of my blog readers (maybe even you!) have been begging me for a healthy brownie recipe with nuts! 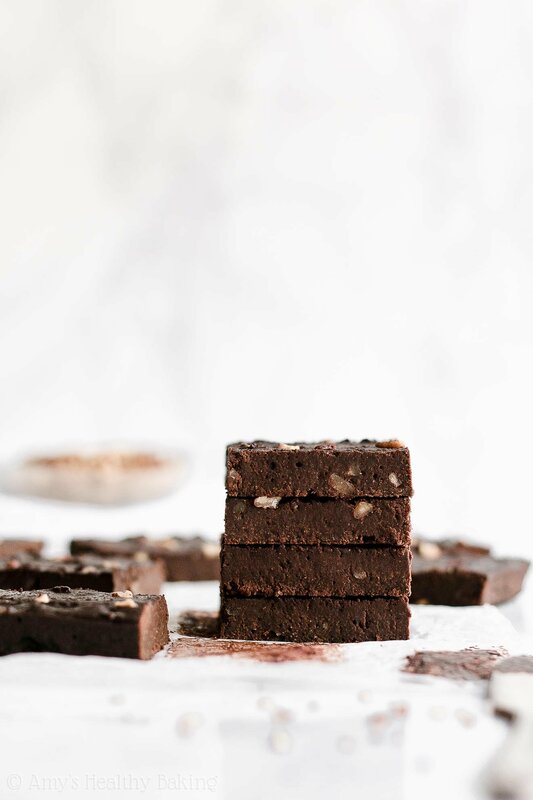 So once I returned home from my trip, I immediately got to work in my kitchen and perfected this Healthy Fudgy Dark Chocolate Nut Brownies recipe for you! 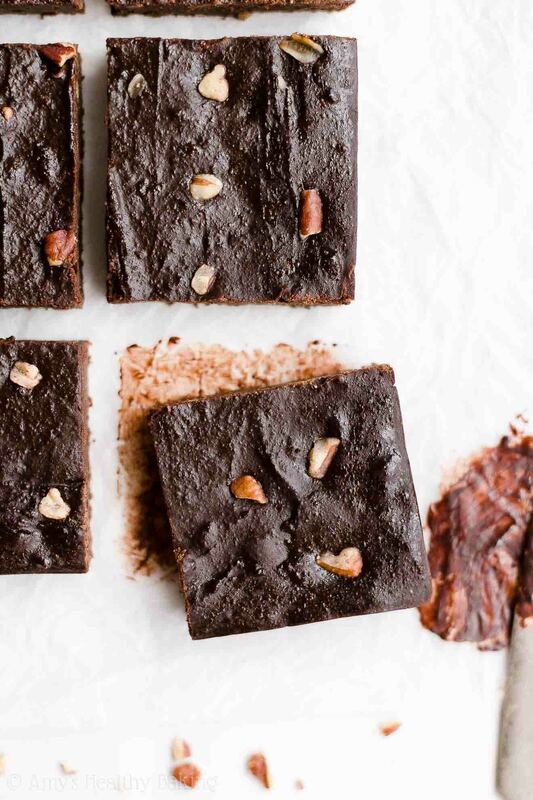 They’re just as rich and decadent as the brownie from my trip, yet these contain no refined flour or sugar… And they’re just 71 calories, too! 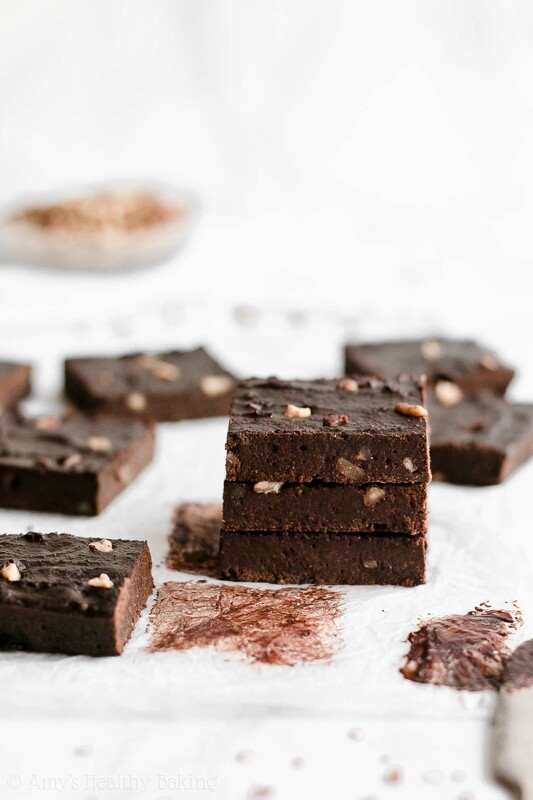 Let’s go over how to make these healthy fudgy dark chocolate nut brownies! You’ll start with equal amounts of white whole wheat flour (like this!) and unsweetened cocoa powder (this one is my favorite!). 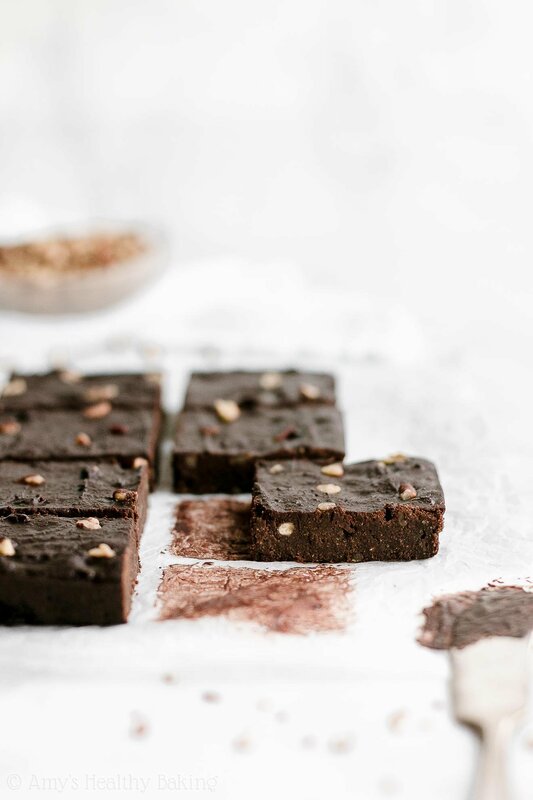 Because you’re adding just as much cocoa powder as flour, your healthy fudgy nut brownies will already taste supremely chocolaty without Dutched or special dark cocoa powder! In fact… I actually recommend against using those. Their flavor is much more muted in this recipe, so your brownies won’t taste as rich and chocolaty compared to using plain ol’ unsweetened cocoa powder. And yes—white whole wheat flour actually exists! It’s not a combination of white (aka all-purpose) flour and regular whole wheat flour. Instead, it’s made by finely grinding a special type of soft white wheat (hence the name! ), whereas regular whole wheat flour comes from a heartier variety of red wheat. They both have the same health benefits, but white whole wheat flour has a lighter taste and texture. 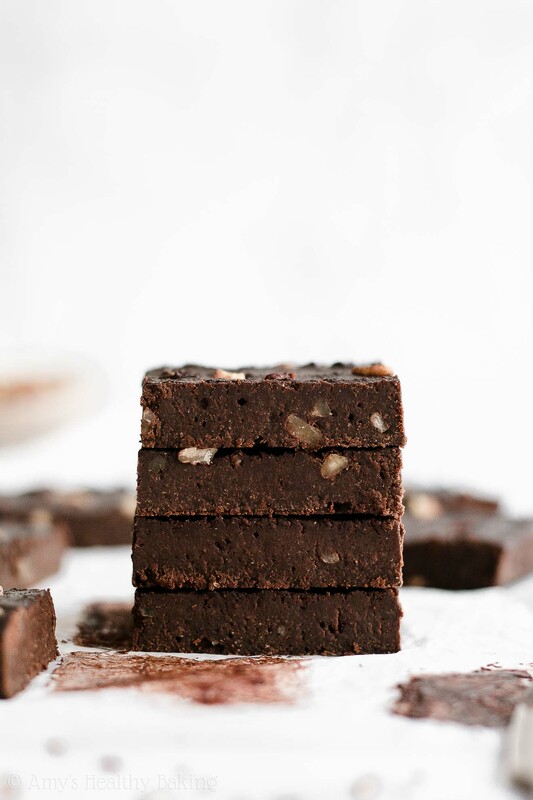 That lets the chocolate flavor and fudgy texture of these healthy dark chocolate nut brownies truly shine! Greek yogurt! If you’ve looked through some of my other recipes before, then you know just how much I love baking with Greek yogurt. 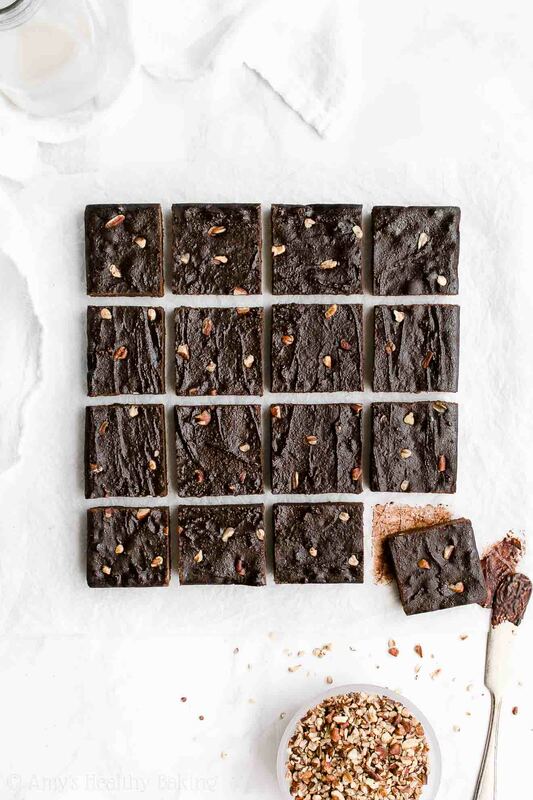 It adds the same moisture to your brownie batter as extra butter or oil but for a fraction of the calories, and it gives your brownies a protein boost, too! You’ll skip the refined granulated sugar and sweeten your healthy fudgy dark chocolate nut brownies with coconut sugar (like this!) instead. Coconut sugar is exactly what it sounds like: an unrefined sweetener that comes from coconuts! However, it doesn’t actually taste like coconuts. It has a rich caramel-like flavor, similar to brown sugar! Time to mix in the nuts! I opted for finely diced pecans because many of my family members are allergic to walnuts. Both work equally well! I use these diced pecans (also called “pecan chips”) as a quick and easy shortcut. It’s so handy to keep that bag in my pantry! One last tip for you! 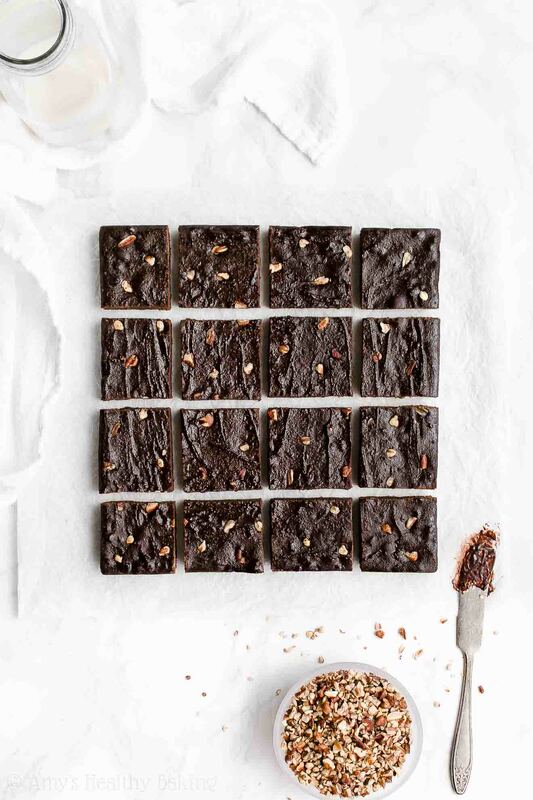 When you bake these healthy fudgy dark chocolate nut brownies, you’ll actually want to pull the pan out of the oven when the sides look done but the center still looks glossy and underdone. That’s okay the center doesn’t look fully cooked—that’s actually good! It’ll continue to cook through while your brownies cool to room temperature and set for 8 hours. Yes, I know it feels like torture to wait that long… But it gives your brownies the most decadent fudgy texture possible! There’s a reason extra fudgy brownies are one of my favorite desserts! ? And when you make your own, remember to snap a picture and share it on Instagram using #amyshealthybaking and tagging @amyshealthybaking IN the photo itself! (That guarantees I’ll see your picture! ?) 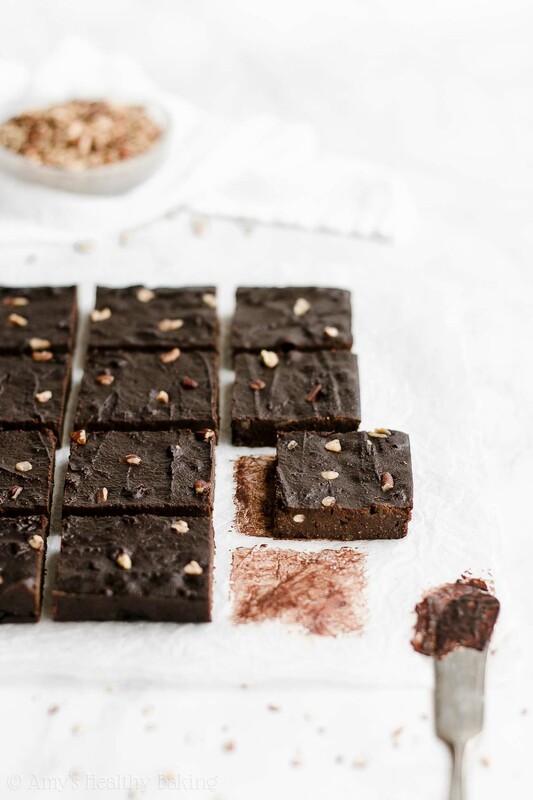 I’d love to see your healthy fudgy dark chocolate nut brownies! These brownies are supremely rich, decadent, fudgy, and chocolaty—just the way I love them! They have a similar flavor as 72% dark chocolate, and the nuts add a fun crunchy contrast to the fudgy and chewy brownies. They’ll keep for at least one week if stored in an airtight container in the refrigerator—if they last that long! In a medium bowl, whisk together the flour, cocoa powder, baking powder, and salt. In a separate bowl, whisk together the butter, egg whites, and vanilla. Stir in the Greek yogurt, mixing until no large lumps remain. Stir in the coconut sugar. Stir in the milk. Add in the flour mixture, stirring until just incorporated. Gently fold in 2 ½ tablespoons of pecans. Spread the batter into the prepared pan, and gently press the remaining pecans into the top. Bake at 300°F for 15-19 minutes (15 minutes yields the fudgiest brownies; 19 minutes yields slightly cakier brownies). Cool completely to room temperature in the pan, and let the brownies sit for at least 8 hours at room temperature for the fudgiest texture before serving. These are the finely diced pecans that I use. Such a handy shortcut so I don’t have to cut my own! Walnuts may also be substituted for the pecans. The brownies are ready to come out of the oven when the edges look done but the center still looks glossy and underdone! The center will continue to cook through as you let the pan cool to room temperature on the counter and rest for 8+ hours. If your brownies start pulling away from the pan’s edges within 10 minutes of pulling them out of the oven, you’ve baked them long enough! For the fudgiest texture, you must wait 8+ hours before slicing and serving! If you cut into them while warm, they’ll taste cakey instead of fudgy. The brownies turn fudgier the longer they rest on the counter. I promise it’s worth the wait! These brownies look amazing! I’m new to your blog, and just made your banana pound cake last night for the first time — moist and delicious — and healthy! Are you able to mention the name of the cute cafe that you visited in Vermont? We’re planning a return trip there before too long, and it sounded wonderful! I’m so glad you enjoyed the pound cake LaRue!! That means a lot to me! 🙂 The café was called The Village Roost. We absolutely loved it! We also had dinner at SoLo and loved it just as much! I hope you have a wonderful trip, and I’d love to hear what you think if you decide to try either of those restaurants! I truly appreciate your kind words and your interest in my recipes Debra! That means the world to me! 🙂 I’d love to hear what you think of these brownies if you decide to try them! I’m so glad you’re enjoying my recipes Hannah! That truly means a lot to me! 🙂 I can’t wait to hear what you think of these brownies! Hi Amy! I made these today and they were absolutely STUNNING! I topped them with mashed raspberries to give it that extra punch and they were beautiful. So thank you for the amazing recipe. Definitely do not taste like 70 calories! I attempted making this brownies previously and failed miserably as I didn’t read the instructions carefully and over baked them . However I made them today with oat flour and they tasted gorgeous , like the unhealthiest brownies you could ever imagine . The only thing I did differently was using two whole eggs therefore I cooked the brownies for about 30 minutes in total as I saw that someone had asked you about using the whole egg in another one of your brownie recipes . I was just wondering if 30 minutes is enough time or in the future should I let them bake for longer? as although they taste amazing I feel like perhaps they needed to cook a bit longer so that they would be a bit more chewy. Also , thank you so much for creating these amazing and delectable recipes as norrmal brownie recipes are so unhealthy that I never attempt making them . I rate this recipe 5/5 stars . For some reason the star rating will only let me rate 4 stars (I am using my phone ). I’m so glad you loved these brownies Attia! That means the world to me that you’d rate this recipe 5 stars — thank you so much!! 🙂 When you say that you’d like your brownies to be chewier, do you mean fudgier and more moist? Or cakier and more dry? I just want to make sure I completely understand what you’d like so I give you the best possible answer! Thankyou for replying so quickly . I mean that I want the brownies to be slightly drier. ? Thank you . When I make them next time I will bake them for longer and will definitely let you know the results !